When you start a beekeeping operation, ordering the bees is the final step. You have many online and mail-order sites to choose from. You can order package bees or nucs from most of these sources, but you should also check with your local beekeeping association since it is sometimes easier and less expensive to obtain your bees from local sources. A nuc is a smaller, nucleus colony of bees as compared to a full hive. It is best to order your bees in the winter for shipment in March through May. Sometimes package bees sell out, so avoid problems by ordering early. Find out more about some of the best online bee suppliers who will ship bees to you; many also have bees available for pickup. There are many more suppliers who have websites, but some of these may not ship the bees, requiring that you pick them up yourself. Draper's Super Bee Apiaries Inc.
Draper's is located in Pennsylvania and sells package bees and queens as well as a selection of beekeeping supplies. They sometimes have nucs available for pickup only. They offer Italian, Italian/Russian, Carniolan, and Minnesota Hygienic Carniolan subspecies of bees. Kelley Bees, located in Clarkson, Kentucky, has been in business since 1924. 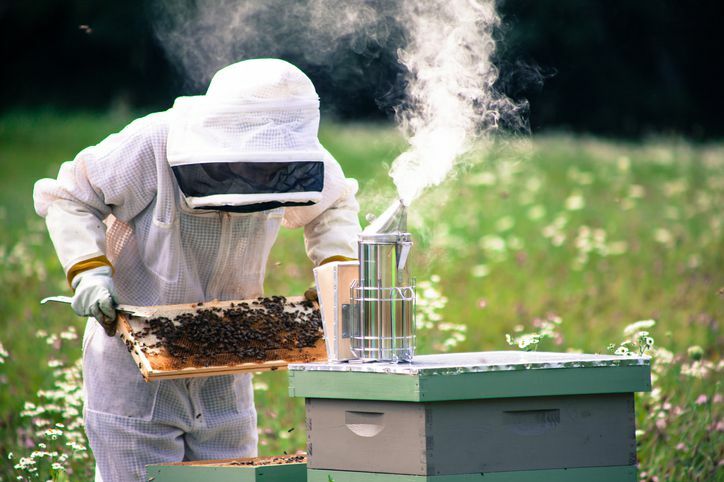 This company sells Italian and Russian package bees and beekeeping supplies such as frames, hive kits to assemble, protective clothing, traps, lures, and extraction supplies. Long Lane Honey Bee Farms is a family business located in Illinois, which sells nucs as well as package bees. They also offer bees as part of their beginner beekeeping kits. Supplies include hives, tools and smokers, protective clothing, queen-rearing equipment, and honey extraction equipment. Since 1936 Rossman Apiaries in Georgia has been a family business that sells package bees, queens, and beekeeping supplies and equipment including hives made of cypress wood. They offer supplements, feeding supplies, tools and smokers, and beekeeping books. BeeWeaver is another family business; this one dates back to 1888. The company sells package bees, queens, and breeder queens for the beekeeper who wants to raise his or her own queens. They are located in Austin, Texas, but ship all over the United States. Their BeeWeaver queens are a combination of Buckfast, BeeSMaRT, and AllStar lines and are bred to be resistant to varroa mites, have high honey production, and produce strong colonies. B & B Honey Farm sells package bees, queens, and a wide range of beekeeping supplies. Founded in 1975 in Houston, Minnesota, B & B Honey Farm initially sold bees in a limited regional area, but now ships to any buyer in USDA hardiness zones two to five. This includes New England and the northern Midwest; on the other hand, this excludes California and most of the southern half of the U.S. Located in northeast Georgia, Sweet Mountain Honey specializes in Italian package bees, and ships to 30 states in the U.S. Sweet Mountain Honey sells package bees and queens, nucs, as well as hives and other supplies.